DESCRIPTION: With just about 8 acres total, this home features all the details of the grand era gone by. Original moldings, windows and hardwood floors, this home is ready for a 21st century renovation. Approximately 8,500 sq ft in total, the possibilities of a total renovation are endless. Over 1,000 feet of waterfront and a honeymoon cottage located at the waters edge and an impressive history of ownership, this once in a lifetime chance to own this property should not be missed. Property also features an original Celtic style water tower and massive copper beach trees. YOUR MAMAS NOTES: Shorewood Manor, the Shelter Island estate formerly owned by New York State governor Hugh Carey, has recently seen a massive price reduction form $33,000,000 to the still astronomical asking price of $24,900,000. The property is still being marketed as a fixer-upper, but it appears that current owner Chris Knight has wisely put a little money into making it look nice for prospective buyers. As many of y'all will recall, Your Mama discussed this property and our intimate knowledge of the place back in early April 2007, which was not long after Mister Knight purchased the property for a reported $10,000,000 and just two weeks later put it back on the market for a staggering $33,000,000. That much of a mark up in that short of a time period takes some serious real estate cajones. While Your Mam never thought for an instant that Mister Knight would get anywhere near 33 million clams, we have to stand up and applaud Mister Knight's brazen money grab. From the new photos, the interior looks to have been sanded and painted and stuffed full of eclectic furniture, some of which looks like catering company furniture and some of which looks like it might be better suited to an outdoor patio or screened porch. None the less, the old gurl is looking better than she has in years. 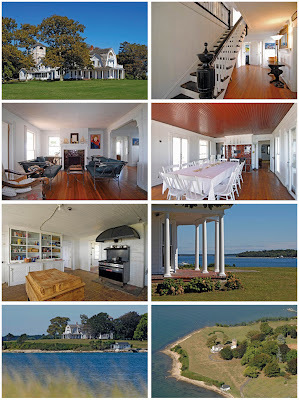 Your Mama has read and heard that the estate can be rented for special occasions and certainly this would be a spectacular location for a soiree of the Hamptons hoi polloi...if you can get them to cross over on the nearby ferry. We have no doubt this property is worth more than the $10,000,000 Mister Knight paid for the place, but we still have a hard time getting our itty bitty and tired mind around the idea that someone might pay upwards of $20,000,000 for a house that needs updated and upgraded everything, and we mean everything. It is the humble and meaningless opinion of Your Mama that Mister Knight would be better off listing the stunning 8 acre property with 270 degree views at $16,500,000 and selling somewhere around fourteen...that would certainly net him a few million. However, given that he's clearly looking for a $10-15,000,000 profit on his investment, perhaps it's worthwhile for him to wait it out, even if it takes years to sell. Best of luck with that Mister Knight. This place needs a lot of work. The setting might make it worth it, but ... if I were that wealthy, I would pass on this. I grew up on both Coasts -- winter in California, summer in Massachusetts. And one of the things I love about the East Coast is that you get these great big spreads on the water with enormous old houses that would benefit from some updating. That, to me, is summer. For 24.9 Mil, I would expect more than a naked light bulb in the Kitchen. Wonderful property. I too hope someone who can appreciate the original structure ends up buying it and renovating it. Will probably be torn down and turned into a resort. Who in the world is this Chris Knight and how does he have the $$ to purchase this and sit on it? The holding costs must be amazing. that property definately has resort of some sort in its future. where did peter brady get that kind of scratch? EXCUSE ME BUT WHEN ARE YOU GOING TO CONTINUE POSTING PICTURES OF LEONARD ROSS' $165,000,000 ESTATE?! Billions and billions of bugs and ticks and things that bite you per square foot on Shelter Island.I will not be going back any time soon! Yes,the asking price is too high and yes, it needs renovation and yes, the first thing that needs to be done is the kitchen, but.....but......what a gorgeous house and what a wonderful view! I love this property! This is truly a case of location,location,location! Keep us posted on this one.